Porcelain onlays are similar to both inlays and composite fillings in that they are used to fill a cavity within a tooth. Unlike a composite filling that is inserted into the tooth as a liquid that hardens into place, an onlay is crafted outside of the mouth to fit into the tooth’s cavity perfectly. The only difference between an inlay and onlay is that an onlay fills the cavity as well as acts as a replacement for a tooth cusp (the top, biting surface of the tooth). A crown, for example, is an onlay that covers the entire tooth. Why an Onlay in Place of a Composite Filling? While composite fillings are more common, they are not suitable for every case. If a cavity or fracture compromises the structure of the tooth or the cusp itself, a composite filling wouldn’t be the best option. In addition, composite fillings shrink somewhat when they harden. 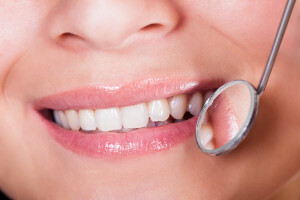 In most cases this is not an issue, but for teeth that require an extensive cavity to be filled, that shrinkage could lead to an improperly fitting filling which can cause further decay. To learn more about porcelain onlays or to make an appointment to see us, fill out the contact form on our website or give us a call at 407-907-6512.